I have a new 2-book deal! In fact, I have two. Only one contract has been signed with blood so I can only provide details about that deal. The series will be released through 47North (print and ebook), and an audiobook producer (audio), and I’m excited about this series! The first book is tentatively titled A Dark Background. 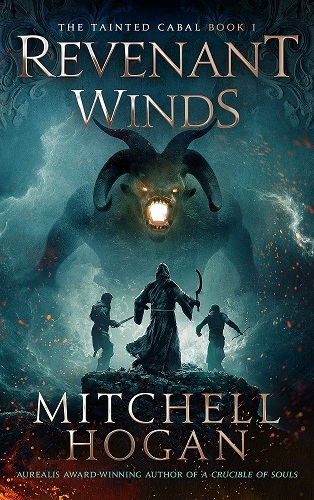 Mitchell Hogan’s A DARK BACKGROUND books I and II, an epic fantasy series about a demon summoned by a desperate sorcerer and bound to serve against his will, to Adrienne Procaccini at 47North (ebook and print rights), in a two book deal, in a very nice deal, for publication in 2018, 2019. After I delivered the recordable file of Revenant Winds to Audible, I decided to work on a sword & sorcery novel during the three month wait until Revenant Winds would be released. But I’d also had an idea for an epic fantasy novel which I was getting more and more excited about (A Dark Background). In order to clear up the details in my mind I put together a blurb and a synopsis. One thing led to another, and I ended up in contact with the editor at 47North who expressed an interest in the novel. After reading a sample she (and the rest of the 47North team) loved it, and they made an offer for a two-book series. I also approached an audio publisher, who made a significant offer for the audio rights. If you read my earlier post on why I’m self-publishing Revenant Winds, then you’ll know that retaining audio rights is an important business aspect for me. Which is why this separate 47North and audio deal is such a great outcome. 47North are aiming for a Fall 2018 (Oct.-Dec.) release of the first book, and the second book six months later. I’ll have more posts about this deal and the series in the future, but for the moment this is all I wanted announce today. A forsaken battleground buried by time. A deadly secret warded by sorcery. When Tarrik Nal-Valim, demon of the thirty-seventh order, is summoned by a desperate sorcerer known as Serenity, he is bound to serve against his will. Serenity compels Tarrik to protect her from colleagues hellbent on her destruction, and it seems they have good reason, for Serenity is sworn to bring back a great evil, and all the battles the world has ever known will pale into insignificance when the Adversary is freed from his prison. But Serenity is not quite what she seems—sorcerers never are—and before long, both demon and master are caught up in a terrifying flood of murder, intrigue, and insurrection. Tarrik is running out of time, as every step they take brings the world closer to the brink. For if Tarrik continues to do as Serenity asks, untold misery and darkness will be unleashed; but if he refuses, it will be at the cost of his eternal essence—a true death for one of his kind. REVENANT WINDS -- release day! Revenant Winds is finally here! Revenant Winds is available at your favorite online retailer — both in ebook and paperback — though some are slower than others to list the book. AND it’s also available as an audiobook through Audible! B&N and iBooks are a bit slow to upload. I’ll provide links when Revenant Winds is available. If you enjoyed reading Revenant Winds, please consider leaving a review on Amazon or Goodreads, as they really help! Thank you! In a world devastated by a series of cataclysms, where the followers of different gods vie for ascendancy, mankind carves out a precarious existence among the remnants of a desolated past. Cities and civilizations are built atop mysterious and ofttimes menacing ruins, and the unforgiving wilderness outside is filled with inhuman creatures and races from before the dawn of history. Sorcery is seen by some as a gift of the gods, and by others as their curse. And the demon-ravaged past has all but been forgotten. Here’s a brief update on everything I have going on. It has been a busy year so far and it looks to continue for quite a while!